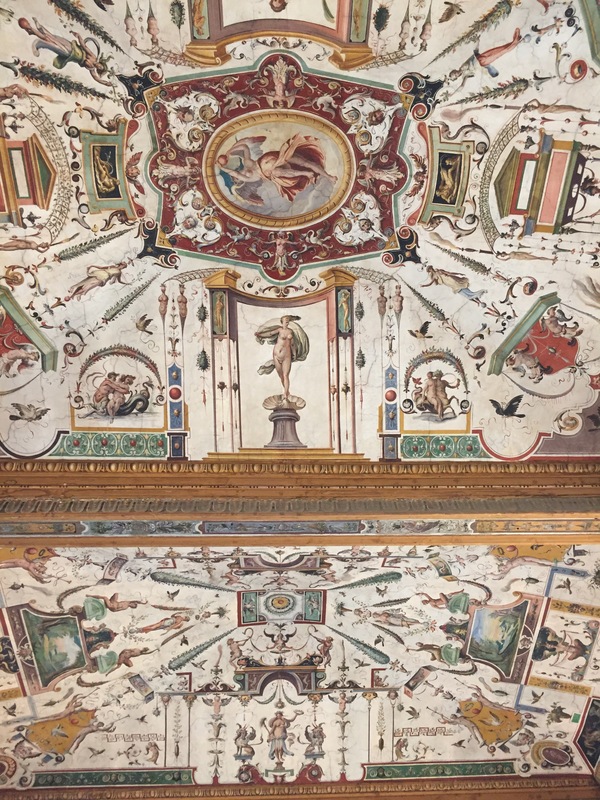 We scanned very quickly the exhibition of Venetian drawings and soon reached the East corridor on the second floor with spectacular ceiling frescoes, busts and statues lined up on two sides. Our journey of awe started there. 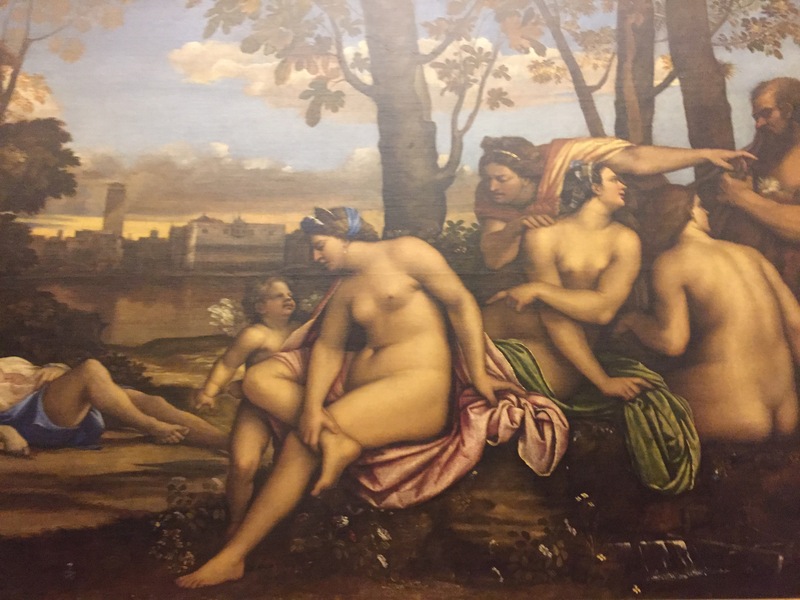 The Uffizi housed the world’s finest collection of Renaissance masterpieces, right where the Renaissance was born. It was created not as a museum but a private gallery of the Medici, one of the wealthiest and most influential families in Italy. 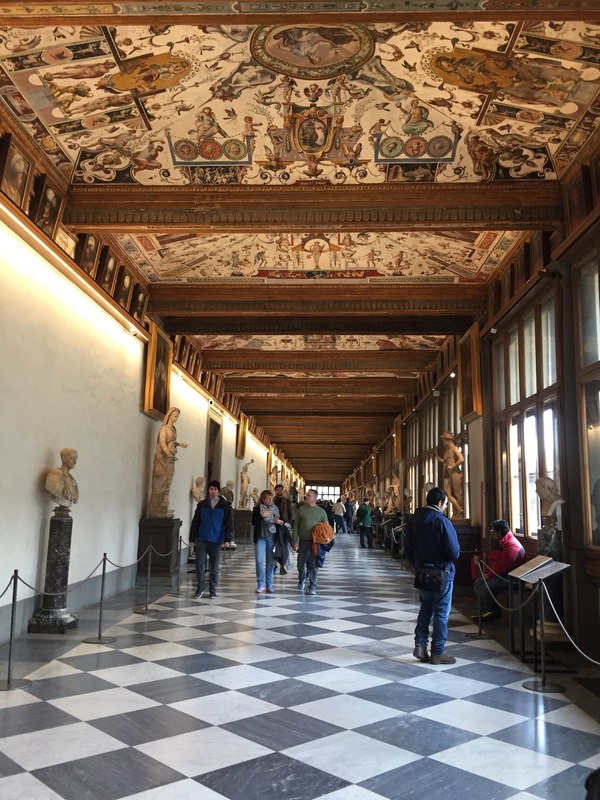 The portraits of Medici family members could be seen on the long corridor walls, alongside paintings of famous intellectuals from various countries and periods. On the left side of the corridor we found the parallel halls where an overwhelming collection of artworks was displayed in chronological order, starting from the 13th century. 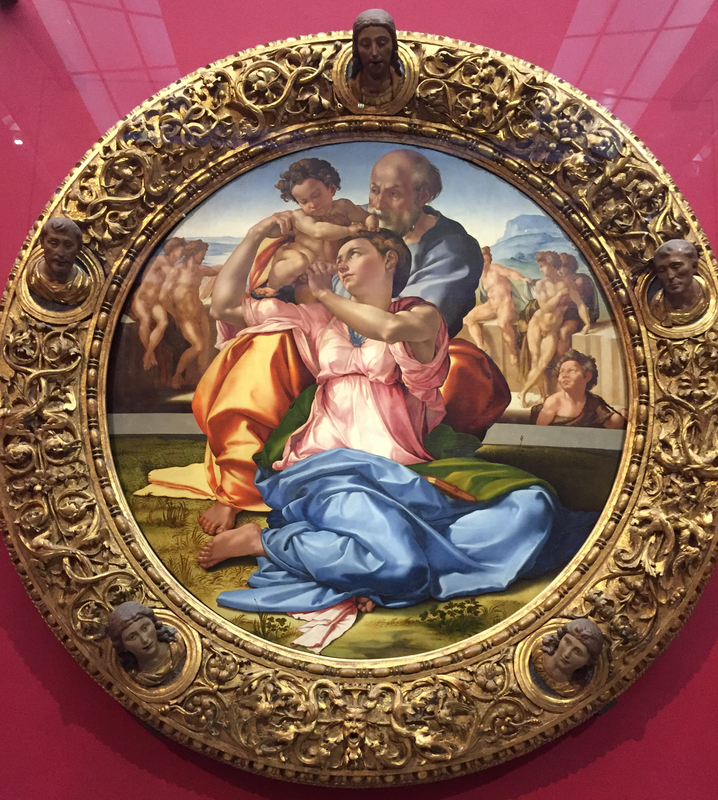 I was able to recognize a few familiar names, Michelangelo, Leonardo, Botticelli and Brunelleschi, but tried to keep my eyes open for the works by other Renaissance masters. Above are two paintings of the International Gothic style, which caught my attention not only for their rich and varied colors but also the enormous size and the lavish god leaf background embellishing the panels. Lorenzo Monaco and Gentile Da Fabriano were among the artists who broke away from the static, symbolic style of medieval art and moved towards naturalism, however the mix of styles was still evident in their works. The transition wasn’t so clear until decades later. 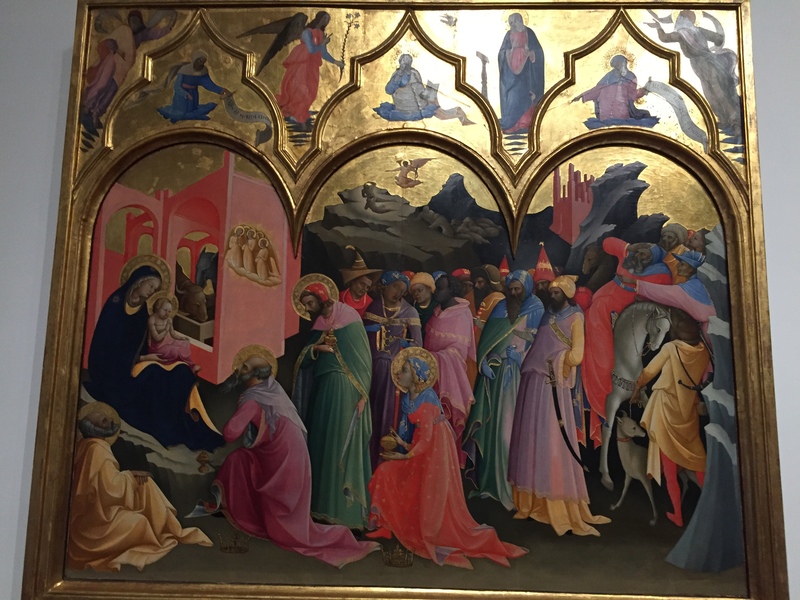 From the Botticelli room onwards, religion was no longer the only subject for art and the human figures became more life-like. Naturalism, a major characteristic of the Renaissance style, was introduced. 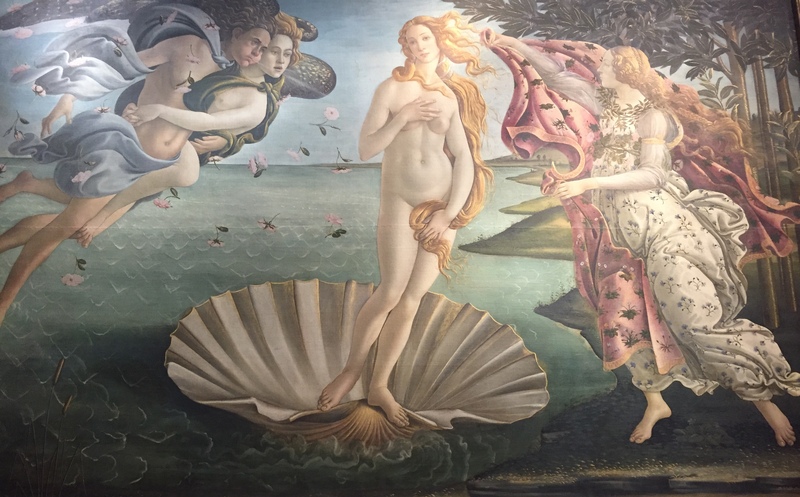 In The Birth of Venus, the background landscape looked so genuine, unlike the symbolic mountains in the Monaco’s Adoration of the Magi. The Godness of Love was posing elegantly while the wind gently blowing her wavy blond hair. Everything was in motion. The further we walked the more evidences of the art transformation we found. One of the most recognisable signs of the Renaissance is the three-dimensional depth. 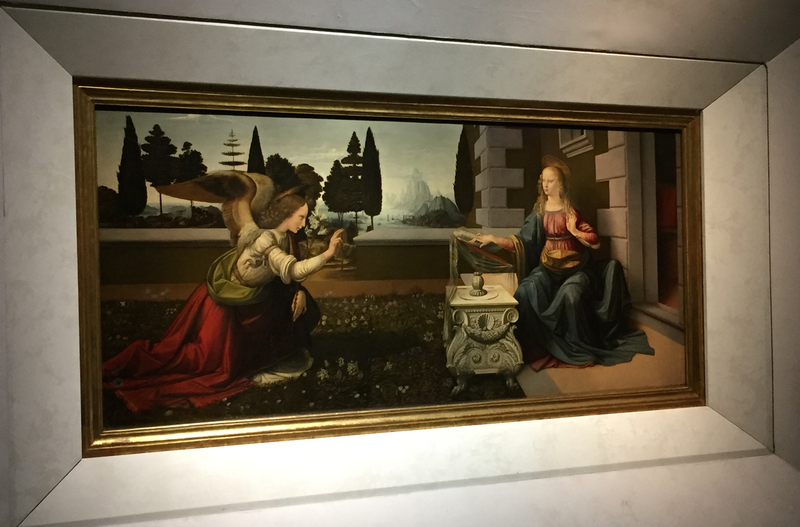 In the Annunciation, Leonardo Da Vinci painted the faces of two figures (Mary and the angel) bright against a dark background and depicted cast shadows, creating a visual sense of depth for the painting. Be prepared for the long line at the entrance unless you pay extra to skip it. The ticket is valid only for the selected date, so start the visit early in the day. Can you imagine we only managed to see half of the gallery after two and a half hours? Backpacks are not allowed inside the gallery. You may leave bags and umbrellas at the cloakroom for free but they won’t take backpacks that are larger than 40x40x50 cm. Make sure you ate something before the long visit. There’s cafeteria there but it won’t be cheap. Other than that, enjoy your time at one of the most famous museums in Italy. Thank you, the Vagabondo! Send my love to Milan! Great photos! We are heading there soon. We were considering hiring a guide to do a skip the line kind of a tour and walk us through the highlights / explain things to us. What do you think? Would it help? 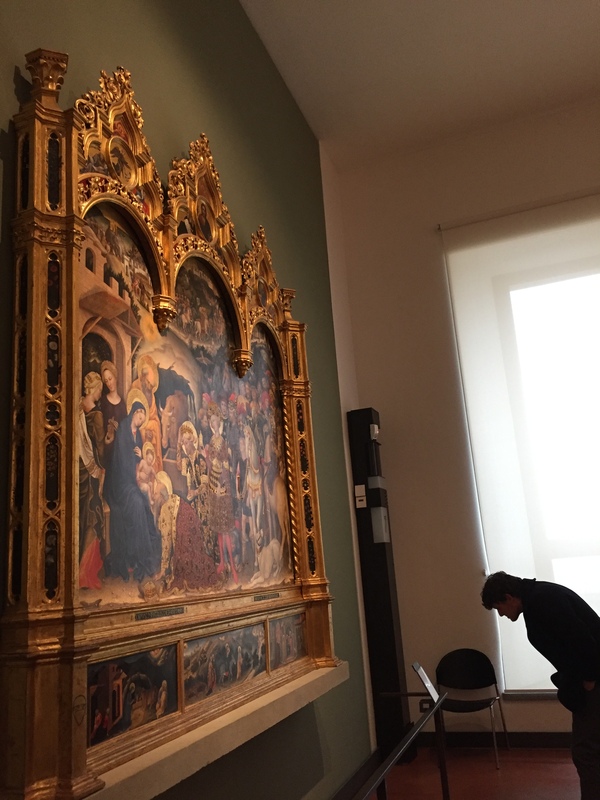 I’ve never hired a guide before, just learn about the paintings through the panels which are very informative. To skip the line you just need to pre-book the tickets online (extra cost for booking is 3e). But of course a guide can give you more insights.